I was about 25 by the time I started cooking properly. Before this I just didn’t seem to have the energy or really want to attempt to produce proper dishes. It was only really after I met my girlfriend that I became passionate about food and the potentially unlimited possibilities that could be created with fresh ingredients. Anna helped teach me the basics and I was well on my way. Now I’m the one that suggests trying new dishes and creates them for both of us. Once in a while though Anna will come up with a recipe and cook it for us. Even though I love being in the kitchen cooking, it is enjoyable taking a night off here and there! 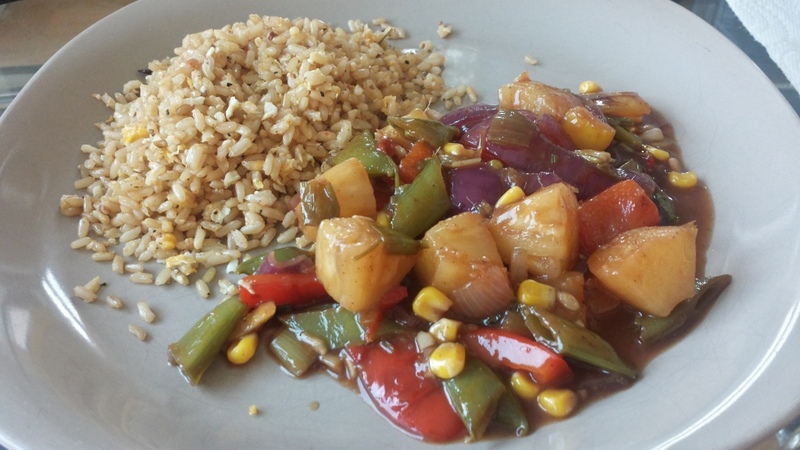 Last night she produced this delicious oriental, vegetarian dish that has a healthy balance of the sweet and the sour. I wanted to share this recipe with you because I’m sure you’ll love it as much as I did. Enjoy! 1. Heat a large frying pan or wok and add the sesame oil. 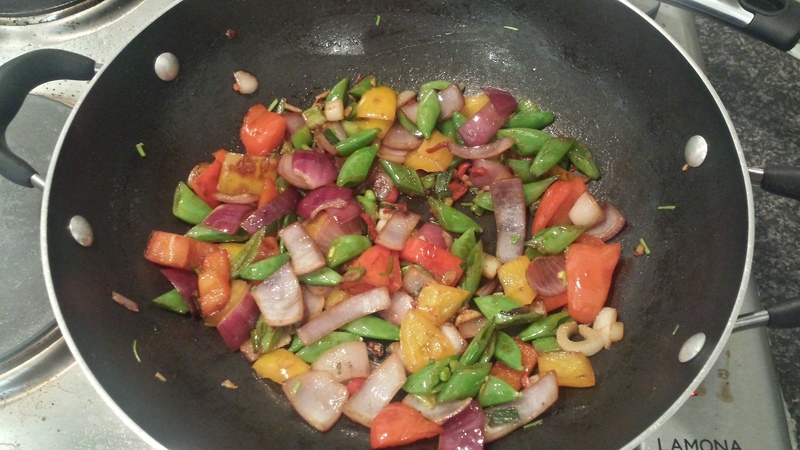 Once hot, add the peppers for 3-4 minutes, then add the red onion and spring onion for a further few minutes. 2. Add the sugar-snap peas as well as the garlic, ginger and chilli to the pan. Slice the coriander stalks and add to the dish for 2-3 minutes. 3. Add the cornflour, soy sauce, rice wine vinegar, pineapple (with the juice), ketchup and 5-spice and then add the frozen sweetcorn for the last few minutes of cooking. Taste and adjust the seasoning as required.